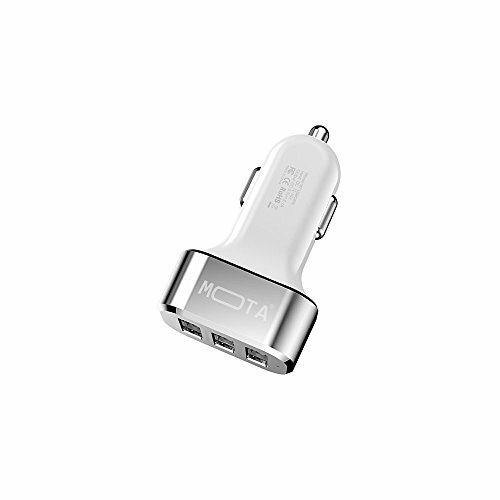 The MOTA® high speed 3-Port USB charger has a powerful dose of 25.5W/5.1A output that'll outclass most competitors. Lathered with a silky smooth texture and luxurious colors, it has a futuristic feel for the modern day driver. While you're on the road or resting in your car, have the confidence to know you'll have power wherever you are. Charge your USB devices today and bring convenience into your life. Marketing Information: The MOTA® high speed 3-Port USB charger has a powerful dose of 25.5W/5.1A output that'll outclass most competitors. Lathered with a silky smooth texture and luxurious colors, it has a futuristic feel for the modern day driver. While you're on the road or resting in your car, have the confidence to know you'll have power wherever you are. Charge your USB devices today and bring convenience into your life.